We are located 20 minutes South of Särna, 40 minutes North of Sälen on road 311 in a small community called Husvallgölen. From the road you will see a sign: “Nordic Footprints”. The nearest airports are Sveg and Mora which is both located within 1, 5 hours car ride. We can help you arrange train & bus tickets, domestic flights and flights to Estonia and arrange transfer from airports and bus stations. 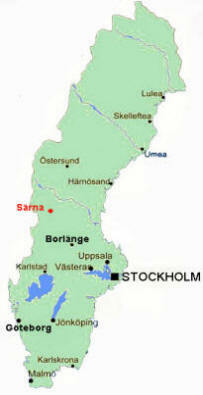 You can travel straight to Särna by car or by train/bus. Or you can fly with NextJet to Sveg or Mora from where we can arrange transfer (approx 2 hours). Here you can find us on Google Maps. - After approximately 40 kilometers from Sälen you will arrive to Husvallgölen where we have our base. 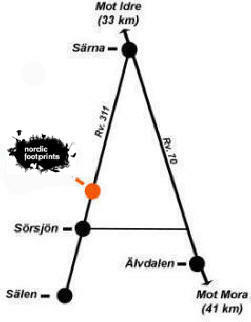 You will also see a sign on the right side; “Nordic Footprints”. - At Gävle, take road E16 towards Falun, and in Falun continue towards Rättvik. - Continue past Älvdalen towards Särna for about 40 minutes. - Turn towards Sörsjön where you turn right on road 311 towards Särna. - After about 15 minutes you will arrive at Husvallgölen where you will see our sign. Lat: N 61º 29' 31.73"
Long: E 13º 5' 20.88"
We have of course lodged a travel guarantee with Kammarkollegiet. Even though anyone who arranges or sells travel arrangements subject to the provisions of the Travel Guarantees Act (1972:204) must lodge. Nature’s Best certifies and promotes the best Swedish tour operators and their finest products. A number of our experiences are quality certified. We cooperate with several organizations working for responsible experience tourism. In addition, we collaborate with other companies in the industry and various retailers.